There are times in our lives when we are shaken to our core. The very foundation of our lives seems to be at risk. It may be triggered by things like political upheaval, health issues or relationship problems. These situations produce strong emotions. You may feel furious, perplexed, distraught, alarmed or apprehensive. When something you deeply care about is at risk, you experience stress. When you positively embrace stress, it propels you to take action in alignment with your values. You feel like you must act to maintain your integrity. You can no longer sit back and watch what is happening. What are your deepest held values? If you had to choose your five most important moral values, what would they be? How important is treating everyone with respect and dignity, being honest, being responsible, and being kind? When you have a strong reaction to an event, it’s likely that one of your core values has been challenged. Your kids will identify your most important values based on how you live your life. Kids are good at ignoring what you say and paying close attention to what you do. What are your kids learning from watching you? 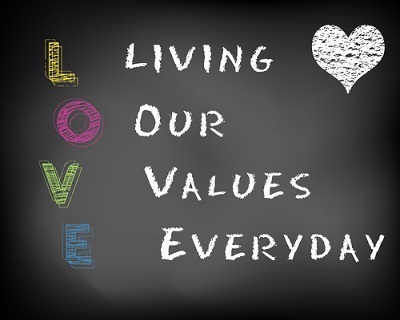 How can you help your kids live their values? McGonigal is describing an immediate physical response to a stressful situation. These concepts also apply to prolonged stressful situations. Your senses are awakened. You are no longer sleepwalking through the situation. Your priorities come into sharp focus. Things that are trivial simply fall away. Your attention is concentrated on the situation. You recognize information that you were previously ignoring. This focused energy motivates you to act. Ideally the action you choose is in alignment with your highest values. Your moral character is revealed by the actions you choose to take or to avoid. Do you choose to take the high road or the low road? Most of us fantasize about some low road options. While these options produce temporary feelings of getting some justice or revenge, ultimately they do not serve us well. Your emotions are always ok – there are not right and wrong emotions. However, how you choose to behave in response to your emotions may or may not be ok. So what can you do to take the high road? What can you encourage your kids to do with their strong emotions? Taking action is critical to owning your power and helping your kids own their power. What is one thing you can do to help the given situation? If you are not sure what options are available, try a couple internet searches on your topic. You may want to join a group of like-minded people who you can work together with to create the changes you are seeking. Jacqueline Way wanted to help her 3-year-old son Nic learn to be generous and create positive change. She thought this was equally as important as learning to tie his shoes or brush his teeth. Jacqueline and Nic decided to do one thing a day to give back to the world. They found simple ways to give back that Nic could do. They decided to record and share what they did each day. After doing this for a year, they wanted to encourage others to join in so they started 365give. You can find inspiring ideas for giving and join for free on their site 365give.ca. Being shaken to your core is not comfortable. You have entered uncharted territory. How will you navigate these challenging times? Your children need you to shine your light on the direction of hope.